In 1402, the Ming Emperor’s uncle usurped the throne. According to one legend, the Emperor survived, and fled overseas; Zheng He’s fleets were dispatched to hunt him down. 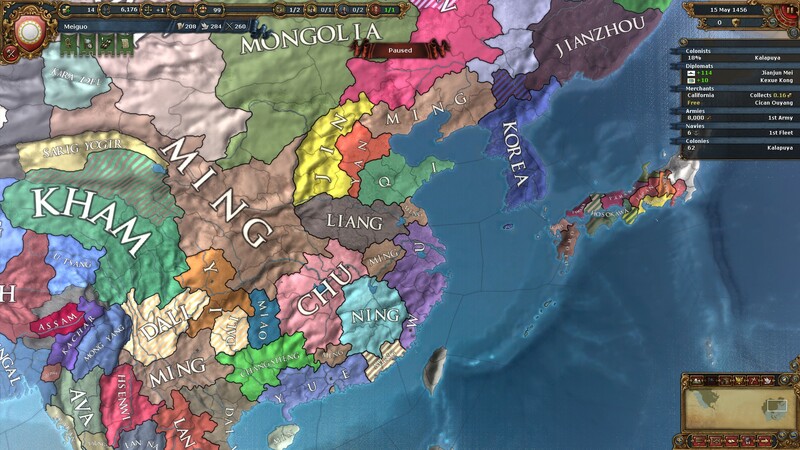 What if the Emperor made it further than Zheng could have dreamed? 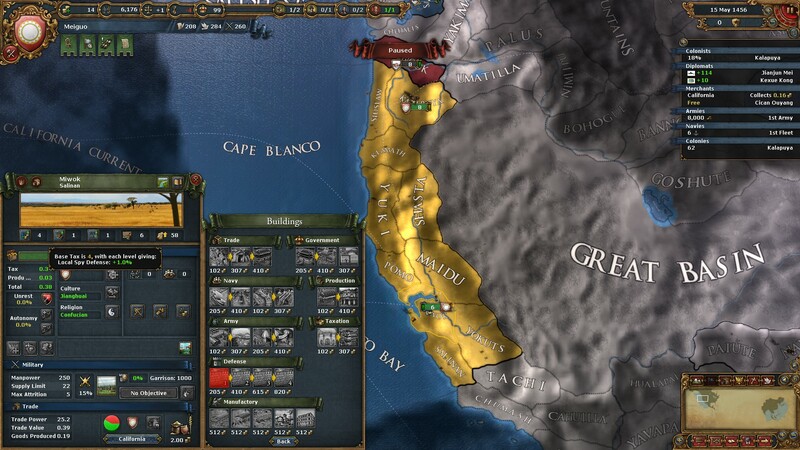 Hello, and welcome back to my coverage of Europa Universalis IV. 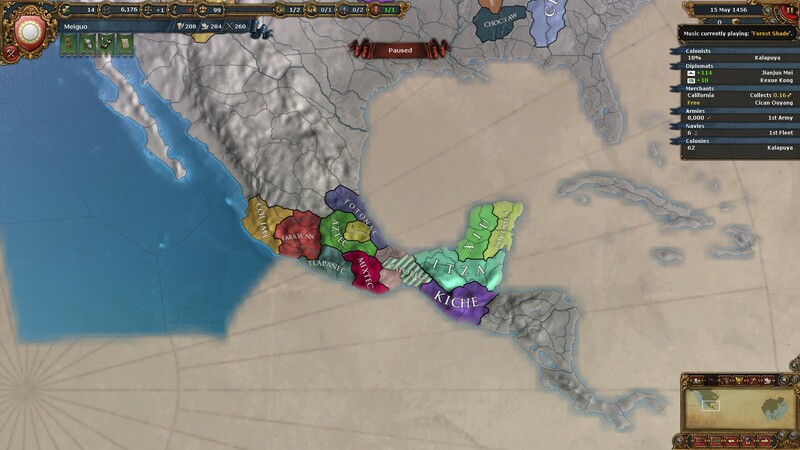 Since I last wrote about EU4, it has received a further two expansions – El Dorado, which added a custom nation designer, and the newly released Common Sense. 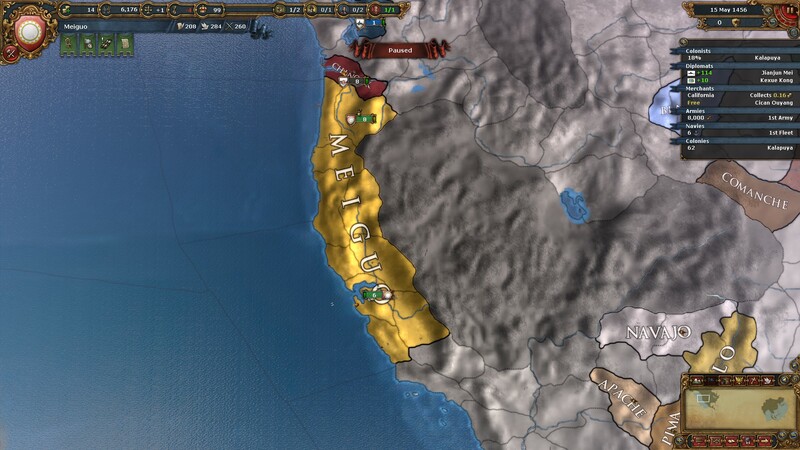 For my current game, I will play as Meiguo, a Chinese custom nation on the west coast of North America. 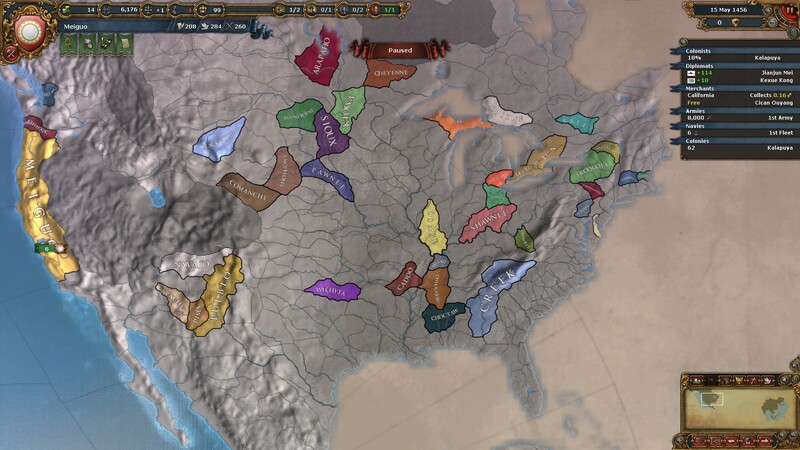 My plan is to colonise as much as I can, adopt European technology as soon as I can, and use the resulting combination of size and technology to dominate North America. This is Miwok, my capital (in our timeline, San Francisco). I have invested some administrative points into upgrading its tax base — the “4” in the row of numbers (4, 1, 1, 6, 58) on the left-hand side of the screen — and I plan to build a fort once money permits. 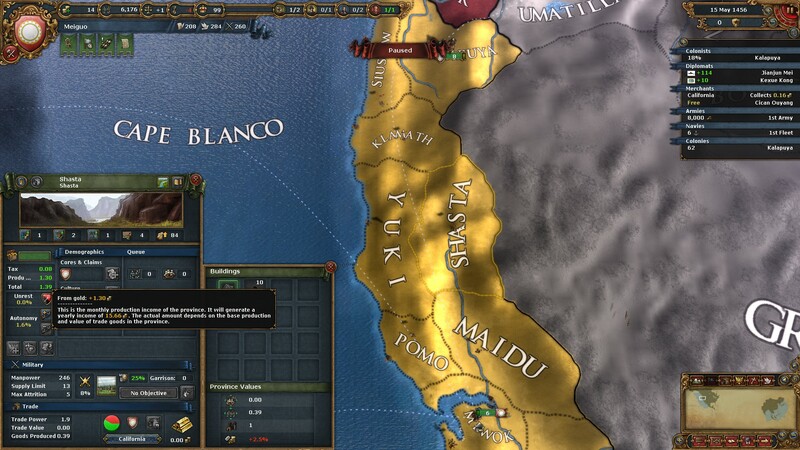 This is Shasta, my second-most important province — its gold mine produces one-third of my revenue. I’ve already invested some diplomatic points in upgrading its gold production (the “2” in the left-hand row of numbers). Siuslaw and the colony of Kalapuya mark my northern border. To their north are the Chinook and my vassals, the Salish. The war against the Salish was closer than it should have been; overconfidence doesn’t pay! I expect my first century to be very easy — none of my neighbours is large or technologically advanced enough to be a threat. The real danger will come when the Europeans show up. Until then, I look forward to a nice, relaxing game! 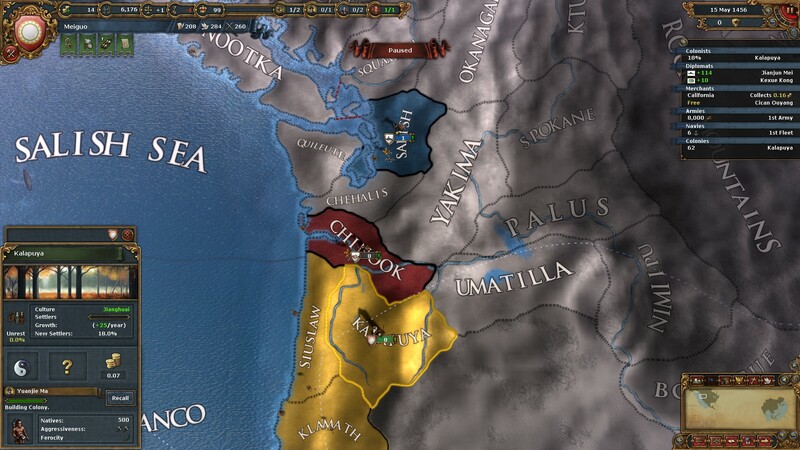 Paradox supplied review copies of Europa Universalis IV and the Conquest of Paradise and Wealth of Nations DLCs. I bought the subsequent DLCs out of my pocket. I grew up in Klamath province, but now I live in Chinook. Go Chinook! Resist Meiguo! Too late! I’ve already absorbed them. Can you tell me which nation designer you have used? Im currently playing the common sense DLC though, Thank you. I’m using the nation designer from the El Dorado DLC. No nation designer mods.